Celebrate Easter in true Italian style with a traditional and delicious Dove Bread! Can you believe it’s Easter time already? ? Time to gather the loved ones to eat delicious food and celebrate little traditions! Oh, I’m sure you’ve already noticed that I’m a sucker for traditions. Especially the ones that involve food! ??? 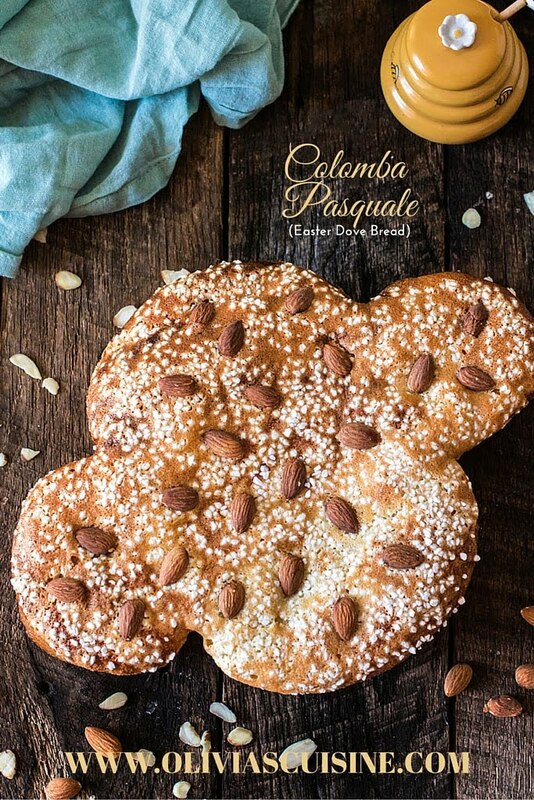 One of my favorite Easter traditions – along with oversized chocolate eggs – is the Easter Dove Bread, or Colomba Pasquale as they call in Italy. 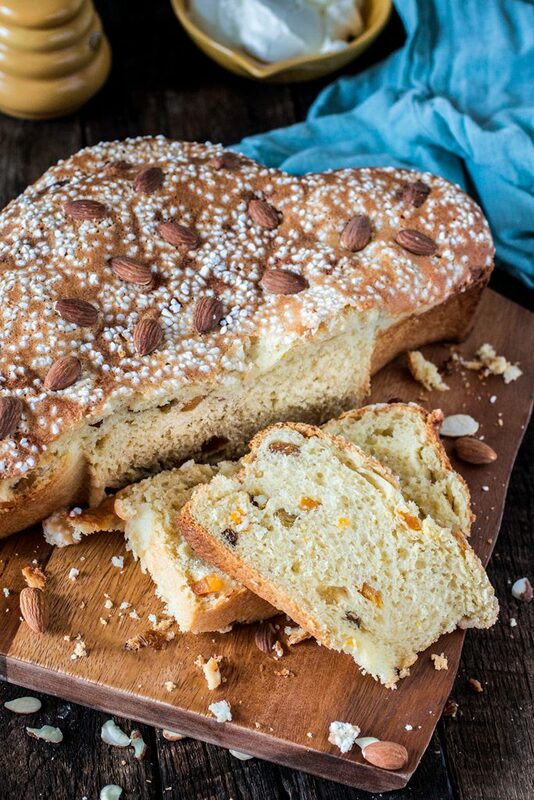 Like the Panettone, this sweet bread is really popular in Brazil, because of our strong Italian heritage, and my family always gobbles a few of these for Páscoa (Easter in Portuguese). I had never made dove bread before, but since finding it in stores here in the U.S. is not as easy as finding them in Brazil (where they are EVERYWHERE during Easter season! ), I decided to roll my sleeves and make my own! In fact, if you have been asking yourself where I was the past few weeks, now you know! I was testing/tweaking Dove Bread recipes. Sometimes I get obsessed with a project and I simply can’t get myself to move forward until I nail it. And, my friends, believe me when I say that this is the best Colomba Pasquale I have ever eaten! The texture is so soft, the bread is not overly sweet and your home will smell amazing! The recipe does requires a little work and time, but it is so worth it! Also, I highly recommend you get some paper dove pans. (I got mine here.) Dove bread shape varies, but I’m more fond of the rustic versions than the more detailed ones that are shaped by hand. You’ll also have less chances of ending up with a Pinterest fail!? I don’t consider myself a strong baker, so whenever I bake, I make sure I use the highest quality ingredients on the market (provided I can afford them!). So it’s no surprise that I partnered with Bob’s Red Mill, since I am obsessed with their products. Last year, Tim and I attended a lovely party hosted by Bob’s Red Mill, where we were served delicious baked goods and cocktails. After the party, they sent me a care package with some flours from their new line. It was love at first taste. And sight too! The packages are so colorful and beautiful. Ever since then, I always have a bag or two of Bob’s Red Mill flour in my pantry. Their Organic Unbleached White Flour is not enriched with any additives and is the same high protein flour used by professional bakers. Baking with this flour always results in high, well-textured loaves of bread as well as light, airy baked goods. Oh yeah, I am a big fan! ? My favorite thing about this dove bread is the texture. That is also the reason it took me almost two weeks of making this until I was satisfied with the softness of the bread. There’s nothing worse than dry Colomba! I was also really tempted to make a chocolate version instead of the traditional dried fruit. However, authenticity won the battle and I decided to leave the chocolate version for next year. The dove bread goes great with some mascarpone and a little drizzle of honey. I like to serve it with coffee for Easter brunch or with a glass of Prosecco if I’m serving it as an afternoon snack or dessert. 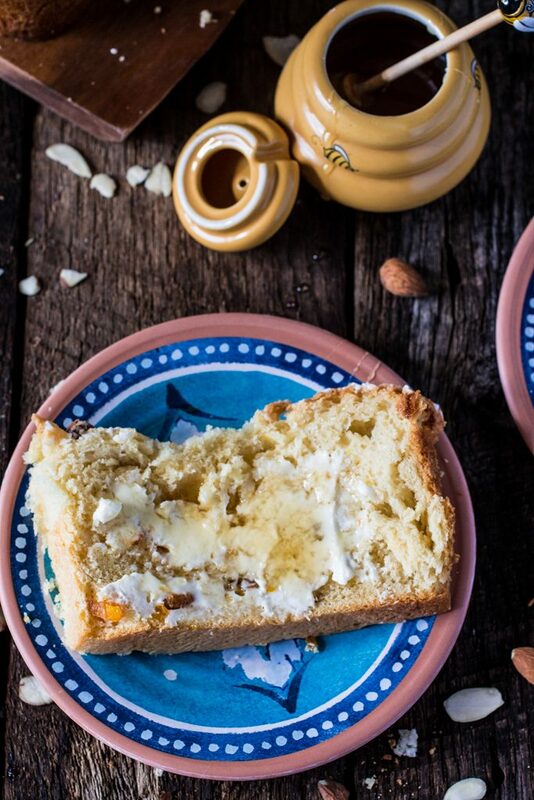 I hope you guys give it a try, as this sweet bread is really exceptional and is guaranteed to fill your Easter day with tradition. Plus, the dove is a universal symbol of peace and rebirth, things that humanity are in dire need of! Oh, and don’t forget to grab this coupon to use with Bob’s Red Mill products. Sprinkle the yeast on the warm milk and let it sit for 5 minutes. Whisk in the flour and sugar, cover with plastic wrap and let it rest overnight (or for at least 6 hours) at room temperature. The next day, combine the starter, the remaining yeast and 2 cups of flour in the bowl of a stand mixer attached with the dough hook. Mix it on medium speed for about 5 minutes. Add the sugar, eggs, remaining 1/2 cup flour, salt, orange zest and Fiori di Sicilia and knead for about 15 minutes on medium speed, adding more flour if necessary if the dough is not coming together. Once the dough is soft and elastic, add the butter slowly while kneading. Continue kneading for 10 more minutes or until the dough is satiny and really soft. Add the fruit and mix to combine. Cover the bowl with plastic wrap or a towel, and let the dough rise for 3 hours or until at least doubled in size. Transfer the dough onto a floured counter and punch it down. Divide the two into two equal pieces and form them into logs (one being slightly longer). Spray a dove bread paper mold with cooking spray and place the dough logs into the mold. The first piece goes across the body and around the edges of the wings. The second piece goes on top of the first piece, placed from head to tail. Pat the dough down around the edges of the mold to fill in any gaps. Cover with a towel and let it rest at room temperature for 45 to 60 minutes or until doubled in size. In the meantime, make the glaze. Beat the egg whites until foamy and whisk in the alomd flour and sugar until you have a white paste-like glaze. When the bread is ready to be baked, carefully brush the glaze on the bread, being careful not to deflate it. Sprinkle with the pearl sugar and decorate with the almonds. Bake the loaf for 15 minutes, then reduce the oven heat to 350°F and bake for an additional 20 to 30 minutes, tenting it with foil for the final 10 minutes of baking, if necessary. The finished loaf will be golden brown, and an instant-read thermometer inserted into the center will register 190°F. Remove the bread from the oven, and carefully slide it onto a rack to cool. Let it cool completely before serving. Wow, this is such a beautiful bread, I didn’t know about this recipe before, pinning and sharing! Thank you for sharing it! I’m loving the book of this traditional bread, Olivia! Sounds like you and your husband have had to eat a LOT of this in the making of the recipe! :P I can imagine how delicious the delicious sweetness of the bread with its zesty orange flavour would be with a lovely slathering of butter – yum! PS. I laughed out loud at those Pinterest fails – hilarious! 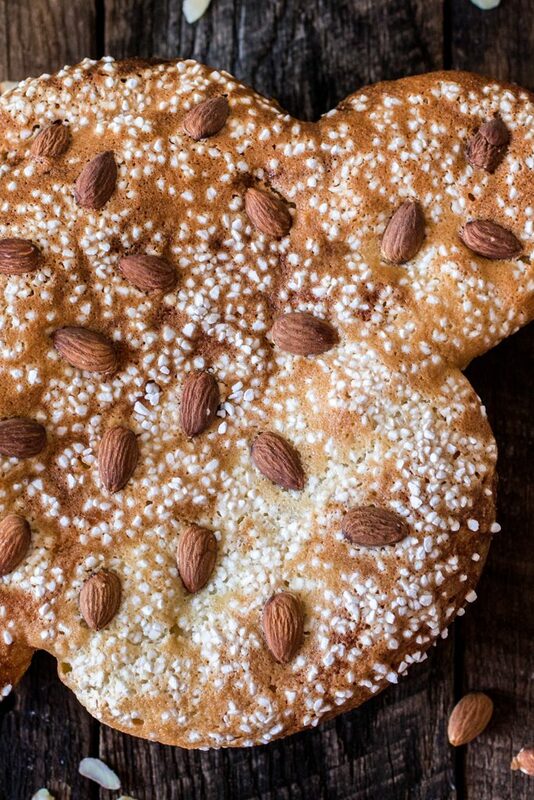 hi thank you for posting this loverly recipe of the “Colomba” its our tradition Easter Sweet Bread, since i’m visiting my son this year in Arizona i brought back a paper pan and going to try this one for Easter , bringing back some memories when they where little living in Italy!